Arena Ready CrossFit - Be My Partner WOD Valentine? Be My Partner WOD Valentine? Lots of Fran PRs in the gym on Friday - great work everyone! It's funny, we program one solo WOD last Saturday to break the sequence of Saturday partner/team WODs and all week long people ask for the return of the weekend partner/team WOD (even after Tuesday's AMRAP). Well, here you go! Please read the logistics blurb underneath the WOD so you're somewhat prepared for what's in store before you come to class (this one's a little different than WODs we've done in the past so it's OK if you're a little confused at first). If any of it is unclear simply ask the coaches and we'll happily guide you in the right direction. Have fun! No, Molly & Molly, it's not like that. At least not for today. But hooray for teamwork! Both partners must run together for the 800m buy-in, and the round of 10 deadlifts cannot start until both partners are in the door. Both partners must complete the 10-9-8-7-6-5-4-3-2-1 sequence, with one partner working at a time to complete a full round before the other partner starts their full round (e.g. 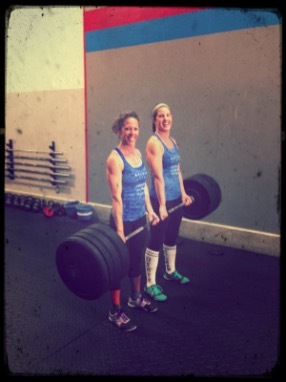 Partner A performs 10 deadlifts and 10 burpee box jumps, then Partner B performs 10 deadlifts and 10 burpee box jumps). The 800m buy-out can be split in any fashion the team desires, and time is called when a total of 800m has been completed.